Because your site should be of interest to those raising a whole child in the USA I have posted a button link to your site, account or page. It is fully explained here. You should find your button to your link on all the coupon pages such as http://www.usavaluescoupons.com/declaration-of-independence/ ; or the home page such as http://www.usavaluescoupons.com/ ; or the footer to all the pages. I know you can help. Hope you choose to do so. There is no more effective way to get the word out than to provide you a gift in the process of introduction. Talk to me if you don’t see it. We want this site http://www.usavaluescoupons.com/ to be a GO TO PLACE for teachers, parents and effective citizens to use and promote simple first things first concepts of opportunity and success. Your advertising makes the site possible. Please, you can do more for yourself and us from this page if you wish http://www.usavaluescoupons.com/submit . Please review the coupons on the site, add your comments and your back links. We are organized as a LLC. We consider it a business to promote and advertise a first things first right the first time grassroots solution directly to the grassroots. Our small gift to you is drawn from equity, but in total it is no small thing. It is a very big idea and one that demonstrates successes every day. We are promoting the solution right to the bottoms up grassroots because that is the only way to real progress. Advocacy of public policy change and new money is not needed around this first things first solution. The solution would intrude in minor yet powerful ways on the powerful programs and districts in place not winning for the most at risk children and moms. Those who are not seen as the solution must become the solution. In many cases the laws are already written as if the poor and the minorities had a say in the goals and outcomes. In this solution of the education gap the blind spot (those not seen) are major players in the creation of the positive expectation. The positive expectation is actually part of the first things first outcome that proceeds as a requirement through the school district. The Socratic logic of this will not be lost with the most effective citizens. Your Message First, Then Our Message Tags Along. 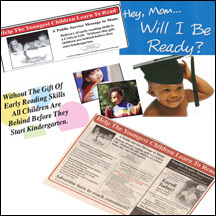 The PSM is sent at "No Extra Cost"
100% delivery of early reading skills can not be done in our lifetime without your attitude! We sell B to B and B to C advertising connected to a social network that includes your message and secondarily is about being certain our most at risk populations are ready for kindergarten. How should we in business present the opportunity to schools and government that by doing first things first we automatically set up avoidance of inefficiency and mistakes. That in turn also sets up the concept of high quality and quality is free and without tears. But really, how should business influence these changes in the public and school sector? This influence is intrusive, positively required, full of negative externalities, and is upside down as it literally focuses on the weakest for the most significant return. The HOW is very important. So important that doing nothing is attractive to many. Refining HOW SHOULD things be done is the subject of his book How. In this area of process management and customer requirements business is ahead of the public sector and schools in savings and innovation process change focused on the 100% avoidance of exceptions. There has been a major movement to do “HOW” uniquely and effectively in business. USA VALUES, LLC suggests business show its true colors by telling stories of FTFRTFT effectiveness in managing constraints AND pledging advantaged private sector assets against bridge loans that create new public money for new deliveries AND insist that each district guarantee the pay back of the bridge loan. Business might / will need to assist in the adoption of the district's own method of FTFRTFT High Quality Continuous Improvement to start. Saving must be expected from the alignment of 100% ready for kindergarten with the pre-k industry and subsequent grades, because and only because, ready to read before kindergarten is a real constraint to the K-12 system of high quality throughput without fail. Believing everything is different when all children actually arrive ready, districts that change core values to include reaching into the community to define first things first and create early reading skills delivered based on the new brain science of what exposure and developments are critical between the ages of 2 and 6 sets up the 21st century savings and innovation expected by those who are effective. Follow these steps to become or stay active with us. The coupon site has COUPONS reflecting the local business to business and consumer economy. Also, it has coupons that can be used by parents, teachers and youth covering the "COMPLETE" set of secular virtues, assets and attributes for the USA. The coupons link age appropriate messages, stories and on line content so the presentations can be made free and easy as needed. This is provided as a public service as we look for ebook publisher/authors to expand on this content for teachers. We also would like to expand the graphics in support of the messages for grades 3-8 children. This expansion will require a cloud and crowd sourcing agent. In both of these cases we are open to proposals from work at home efforts. Good For This District, But Is It Enough? Thanks,Early literacy is freedom; working for less than 50% of USA Kids; Does this work for you? How can this work for you?